Shoutouts, Abubot Philippines & Rami Muiny, 12/17/2014 - KABALYERO - PLAY, BLOG & EARN! Since, I'm not doing this Daily anymore, I'm going to rename it to simply Shoutouts until I come up with a better name. Shoutouts is where I'll give a shoutout to you guys. For my Shoutouts, I will pick one from my Twitter Followers and one from my YouTube Subscribers. So, here are my shoutouts for today. My first shoutout pick for today is from my Twitter Followers and it's for Abubot Philippines. Abubot Philippines is your online Philippine geek, toy and novelty shop. Abubot Philippines' Twitter account contains updates on the latest items that are on sale in the online store. Check out Abubot Philippines in Twitter at https://twitter.com/AbubotPH. 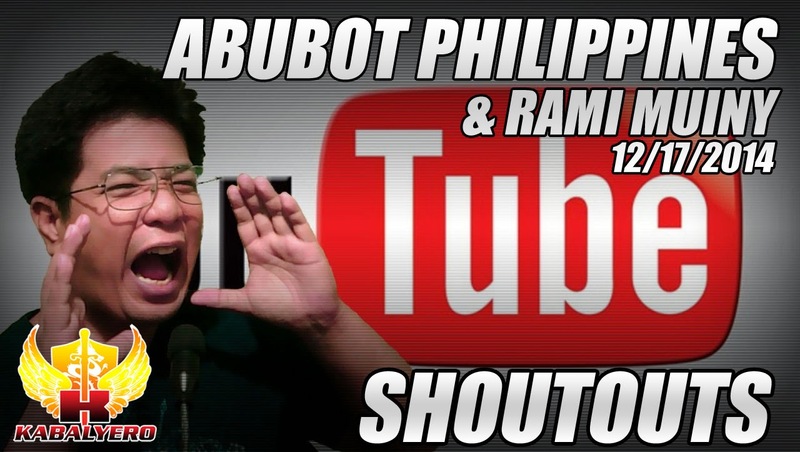 My next shoutout pick for today is from my YouTube Subscribers and its for Rami Muiny. Rami Muiny is not just an ordinary subscriber. He is also a young YouTuber who uploads gameplay videos of various games. The link to Rami Muiny's youtube channel is https://www.youtube.com/user/Rmuiny. So, go ahead and check him out.